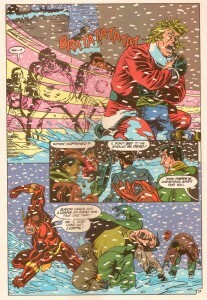 Out of the Vault – Merry Christmas From the Flash! 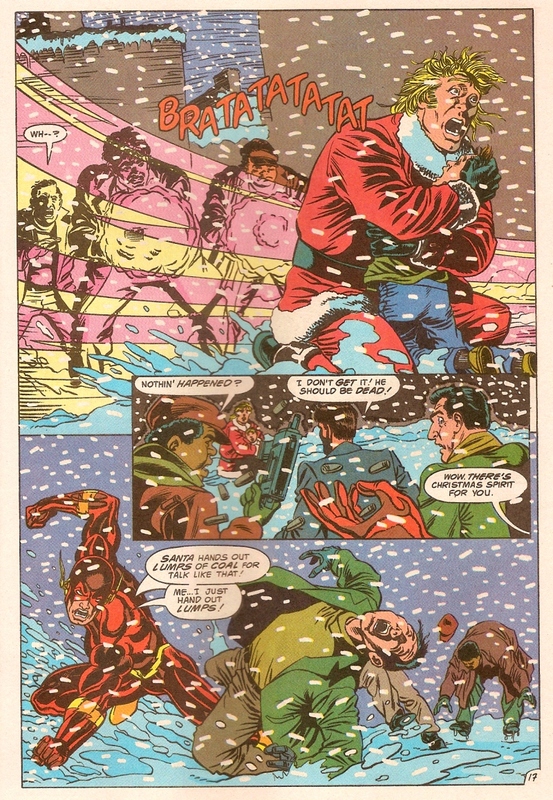 Yes, I know, it’s late in the day to finally be posting this, but I had to dig through a lot of comics before finally finding a Christmas-themed story worth posting (I have some better ones, but they are still in the Vault, so maybe next year). So from February 1993 (remember that comics tend to come out a couple of months earlier than the cover date), please enjoy The Flash in “Dashing Through the Snow.” Sorry, that’s only the cover copy. 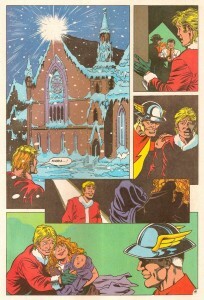 The actual title is “One Perfect Gift,” written by Mark Waid and drawn by Greg Larocque and Roy Richardson. 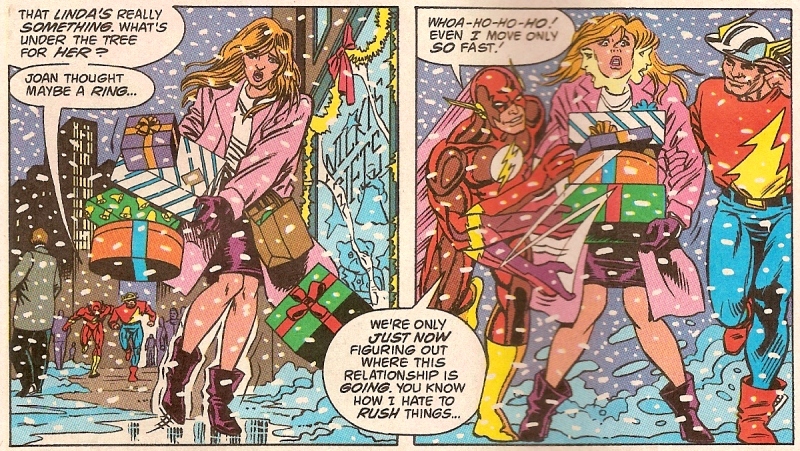 So Wally West, the Flash, is with his girlfriend celebrating Christmas at the home of Jay Garrick, the Flash (retired). Wally is impatient and keyed-up over Christmas, so Jay takes him out of the house so the women can cook and decorate in peace. However, it being Christmas, there’s not a lot of crime going on, so the two Flashes go on patrol volunteering at a soup kitchen and saving presents from hitting the ground. While Wally heads to the store to find Joey. He checks all the clerks there, but no Joey. Then he realizes, he never checked the store Santa. And sure enough, at that moment, Santa Joey is breaking into the office to steal a huge pile of cash. As he’s making his getaway into the alley behind the store, a kid has tracked him down to ask him to make his mother happy, because she’s so sad that Daddy is in jail. Santa Joey has an attack of conscience and turns around to return the money. But then the thugs show up and decide to kill Joey and take the money for themselves. labelled “Symbolism Mallet,” and he hit this page with it about fifty times. What do you want to bet they named the kid Chris or Hay-sooss or something? Anyway, Wally and Jay go back home, where they are happily winding down their Christmas celebration, when there’s a knock at the door. Wally is just saying that he can’t imagine a better Christmas present than he has already gotten when he answers the door. Who should it be outside? 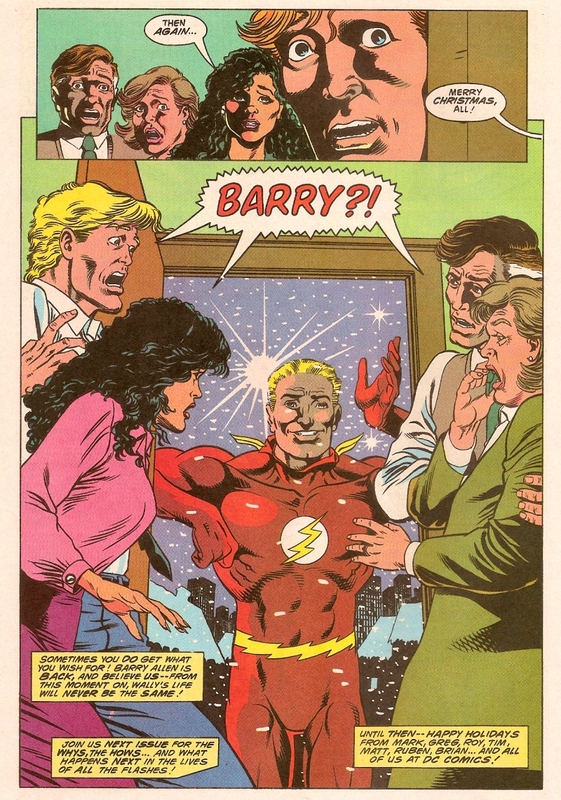 Why, Barry Allen, of course. 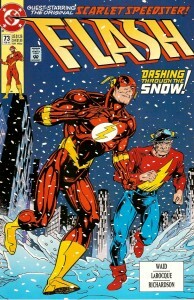 The second Flash, the one Wally inherited the mantle from and who famously died in Crisis on Infinite Earths. Of course, it all turns out wrong in later issues. 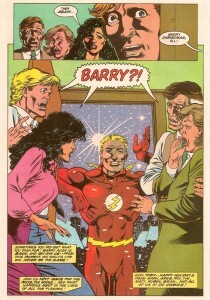 Barry turns out to be an imposter, and there is much hurt feeling. But that’s later. For now, Merry Christmas! This entry was posted in Out of the Vault and tagged comics. Bookmark the permalink. 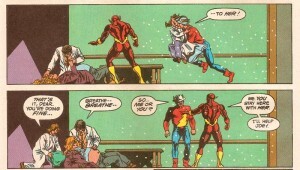 One Response to Out of the Vault – Merry Christmas From the Flash!